The first question that people say when you mention their aura is "tell me about my aura color meaning". If they undersood even half of what the aura does then they would be far more interested in digging deeper and looking past the basic aura definition and discovering exactly how it can be used to heal the body. If I were to describe how I see aura colors to you, I think that I would have to say imagine the medieval paintings of saints with golden auras around their heads and this is probably the closest representation you will get of it. It does contain many colours which clairvoyant people can see, and gold is taken to be a very spiritual colour. Sometimes I can see it more like the Ready Brek man with his red outline around his body. It is more usual though to just see flashes of aura colors around someones head. The personality is something that can be assessed from the etheric bodies quite effectively, but here we seem to be in the realms of high clairvoyance. I will give details of what each aura color meaning is likely to be I cannot stress enough that the same color combinations can mean two totally different things in different people, and also that it is really far more useful to be able to locate and close imperfections in the aura than learning how to see auras. Any aura color meaning is purely a subjective theory and as to yet no-one can make any hard decisions on what they mean. What can be easily discerned though from each color meaning is the different states of mind of a person. Aura colors should basically be separate and it is the clarity and purity of the hue that indicates the person’s personality and state of mind. If you find that the aura colors are jumbled up it can signify a confused state of mind, and if the colours are muddy and pale it shows that someone is not living their life to the full on that plane of existence. For example, green is the harmony colour and should be a lovely emerald green, Other people who are not happy in what they are doing with their lives will vibrate on a muddy green. So the moral here would seem to be that the kinder we are to ourselves the happier we shall be. Here we must touch on the emotional content of our lives. It would seem that if something happens in our lives which the spirit cannot take, it sends a message to the aura. The aura extends through the physical body and also the chakras run through the aura. Understanding this helps us to understand the connection between the emotions and physical illness. The emotions show up in the aura. The aura can easily be damaged by extreme emotions and the chakras run through the aura and also to the physical organs of the body. Any "dis-ease" in the aura is transmitted via the chakras to the physical body and manifests itself as actual physical disease. Aromatherapy is the most powerful healer in this way as the oils each resonate on a spiritual level, an emotional level and work as physical healers too. By understanding how the body heals itself on each of these levels, you find yourself in an extremely powerful position to heal many physical illnesses. These traumas can manifest in someones aura many years before diseas is obvious in the physical or even emotional bodies. This is why we get changes in the aura, sometimes years before they occur in the physical body. Whether the brain takes notice of these messages is another matter. Sometimes it will ignore them, perhaps for years and this sets up a circle of unrest and physical illness. So although I am not preaching that we should be entirely selfish, it is important to do things that we really want to do, no matter how trivial they may seem to others. To blot out part of our spiritual development or our personalities, is in the long run asking for trouble. The colours in the body are usually placed but not always, in the same pattern as the rainbow. Some people may have all of them, although this is rare especially with the more spiritual shades, and other people may have just three or four. The colors nearest to the head are usually the the ones that will show you aura color meaning for the physical body- red, orange and yellow. Next come the harmonious greens followed by the more spiritual blues and purples. 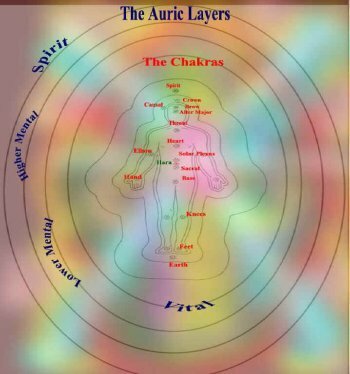 Aura color meaning of red aura / Orange Aura / Yellow aura / Green Aura / Blue Aura Indigo and Violet aura colors (some refer to them as purple aura colors) There are also colors which are not in the rainbow but which do occur in the aura. Grey indicates a rather red tape mind. One would expect it from someone who worked in Whitehall all their lives. A plodding unimaginative type, however I have found it to occur when someone has had a chronic illness, often back problems, and depression, when the colour occurs next to the head. Black. If you see this, beware. It is an aura color meaning that can signify that a person is negating a complete emotion and / or having very evil thoughts. A pink aura can signify a very gentle healing spirit. Crimson shot with black is depravity. At this point you cannot deal with either of these things, so say nothing, and attempt to stay out of their way in future. Silver is another colour of mercury and occurs in auras or the talented communicator or movers. However could also be the aura color meaning of inconsistency and weakness. Brown is the business man’s colour is usually the starting point if some ambition. White is a psychic colour, especially of it preceded by a mixture of blue or green, but it can also mean viral infection.